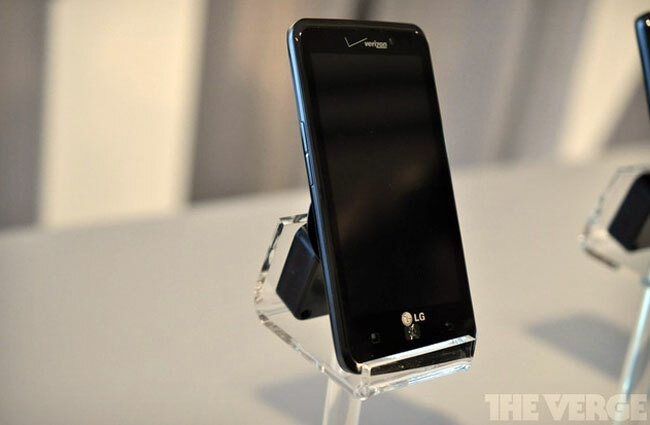 It looks like LG is showing off their latest Android smartphone at CES 2012, as the guys from The Verge have got some photos of this new 4G LTE device which is headed to Verizon wireless, the LG Spectrum. It doesn’t look like there is any sort of official announcement with the full specifications as yet, but what we know so far is that it will come with a 4.5 inch True HD IPS touchscreen display with Gorilla Glass, it is powered by a dual core 1.5GHz Snapdragon S3 processor, and also features 1GB of RAM. The LG Spectrum will also come with a microSD card slot and 4GB of built in storage, it will apparently come bundled with a 16GB microSd card and it features two cameras. Up front there is a 1.3 megapixel camera for video chat, on the back there is an 8 megapixel camera which is capable of recording full HD video in 1080p, plus it also comes with Android 2.3 Gingerbread. Of course these specifications have yet to be confirmed by Verizon or LG, we should have some more details later.